More than five years after the NRC embarked on its review, another step in the agency’s thorough and detailed review of a license renewal application for the Indian Point nuclear power plant will take place beginning next Monday, Oct. 15. It’s on that date that an evidentiary hearing regarding the request for a 20-year license extension for the Buchanan (Westchester County), N.Y., plant will get under way at the DoubleTree Hotel in Tarrytown, N.Y. The focus will be on 10 different contentions submitted by New York State and two public interest organizations, and admitted into the proceeding for further review. A three-judge panel that is part of the Atomic Safety and Licensing Board (ASLB) will conduct the hearing. 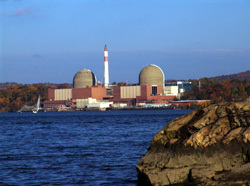 The judges will pose questions to expert witnesses for Entergy, the company that owns and operates Indian Point; the NRC; and the interveners — the state, Riverkeeper Inc. and Hudson River Sloop Clearwater Inc.
It’s important to note that the oral testimony will represent only part of what will inform the judges’ eventual rulings on the contentions. Indeed, the judges will also consider a large volume of written submittals from all of the parties that elaborate on the issues. This will not be the first time a license renewal application has been the subject of such a hearing. Other applications to undergo an evidentiary hearing have included Oyster Creek, Vermont Yankee and Pilgrim nuclear power plants. But the sheer number of contentions related to Indian Point to be reviewed means that numerous days of testimony will be required. The ASLB panel has scheduled Oct. 15-18, Oct. 22-24 and Dec. 10-14 for that purpose. Also, additional hearing days are expected to be conducted next year. That’s because the parties will have a chance to submit contentions not yet ripe for adjudication because of, for example, anticipated revisions to the Environmental Impact Statement by the NRC Staff. Space for the hearing set to begin Oct. 15 will be limited. Those interested in attending are urged to be on hand early. The proceeding will begin at 1 p.m. the first day, with the doors opening at 12:30 p.m. On subsequent days, the room will open at 8:30 a.m.
An NRC press release contains further details on the hearing. More information about the application in general can be found on the agency’s web site.